By now we’d learned a lot more about our guides and had discovered just how lucky we were to get Samuel and his team as our leader. Samuel Kusamba had quite a list of varied clients who he’d led to the top over the years. Everyone from Jordan Romero (the youngest to climb all the 7 summits), to groups of Russians who required additional porters just to carry all their vodka. The outfitter and guides play a huge role in the Kilimanjaro experience and we were so lucky to end up with such an experienced group. 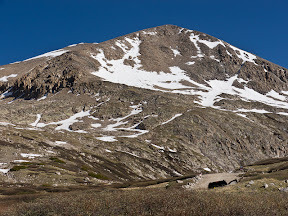 Today would be a “short” day – less than 3 miles, but we’d have to hike to higher than the Lava Tower (15,300 feet almost) to reach our high camp. “Resting spot” might be more accurate than “camp” – as we’d relax there in the afternoon, eat an early dinner then wake up before midnight to start our climb to the summit. But first we had to walk those 2,000 feet up to Barafu Huts. The trail seemed even more crowded today, as everyone wanted to be on the same schedule and get to Barafu early to rest. At this stage we’d met quite a few other groups at camp and on the trail so checked in with people as we’d pass and be passed – the Maryland group, the Brits, the other couple from Boulder, etc. After the short hike we gathered in camp – replacing another Tropical Trails-organized group who was just returning from the summit and packing out for a lower camp. Lunch, relaxing (where, unable to fall asleep, I listened to my iPod for the first time and the all-too-appropriate 5 types of B.O. episode from the Dirtbag Diaries podcast), and planning what to wear/pack for the summit. After dinner I still couldn’t fall asleep and Tara decided she didn’t want to try for the summit. Downhills are tough on her knee and from the summit we’d have over 9,000ft to descent tomorrow. Plus, she knew enough about slogs from other peaks and was personally fine with not going to summit of Kili. All of us “woke up” for midnight breakfast then started out in conditions that weren’t yet very cold. Yesterday, Samuel had given us a final briefing when he had emphasized that we’d hike extra slow and keep a steady pace. Reaching the summit wasn’t going to be a competition with other groups. So I found it humorous when after hiking up the first steep right out of camp he had already judged our pace relative to the lights of groups ahead and predicted “we’ll pass almost all of these people”. For the first 2,000 feet we kept up a light chatter while Samuel led us and Immanuel, Joseph and John hovered close by watching us for signs of trouble and offering to carry our packs. 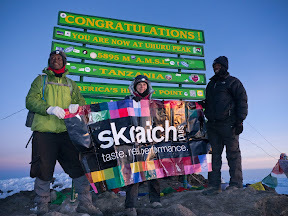 A mix of pride, feeling good, prior experience with 5000m peaks and the Skratch Labs banner in my pack kept me from allowing any of them to carry my load. However, the weight on our backs did decrease for all of us, as we made a few stops to add more layers feeling the temperature drop the higher we went. Georgia’s water bladder’s hose froze and Paul and Immanuel tried to blow it clear in the thin air. Sure enough, Samuel’s slow and steady pace had us passing other groups, some who would hike quicker, then take longer more frequent breaks. Other people looked sick and suffering on the side of the trail – maybe they’d spent fewer days acclimating on the approach or were just having a harder time of adjusting. Thinking back later we realized we only took about 5 very brief stops the whole climb up from our last camp. It had been over 7 years since I was last on a big mountain like Kilimanjaro, so I wasn’t exactly sure how my body would do. Luckily I felt pretty good and with a little pressure breathing managed to keep a minor headache away. Far more inspiring was to watch Georgia, Claire and Paul – each of whom had never been this high and exhibited a lot of determination to push themselves into the unknown and accomplish a goal that wasn’t a sure thing. Sure it’s inspiring to watch professional athletes perform to their conditioned level, but I always find watching regular people doing something on the edge of their ability more impressive. 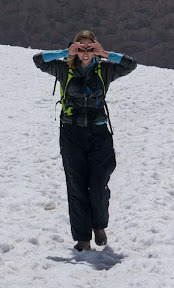 It was with those feelings, and a bit of euphoria brought on by the altitude that we suddenly reached Stella Point on Kilimanjaro’s crater rim and knew we only had 45 more minutes or so to reach the real summit. Sunrise was just breaking the horizon behind us, with the crescent moon hanging above. The steepness was largely behind us, but the altitude was taking a toll on everyone. More other hikers would just stop and pause for breath in the middle of the packed trail in the snow, not stepping aside and backing up everyone. The still conditions we’d been blessed with for the whole climb were broken now with just a light wind – but it felt much colder at this altitude. But soon the new summit sign was visible just ahead. Reaching the summit together we gathered around the signs for several photos and I folded out the Skratch Labs banner one last time. My hands ha gone numb taking photos so as we marched back down I swung my arms trying to get blood to flow back. I still couldn’t resist getting a few more photos of the morning light on the Rebmann Glacier and was willing to deal with cold digits a little longer for photos I’d never have another chance to take. Once we hit Stella Point, the warm began to return quickly and we soon started to drop altitude rapidly. Not everyone in our group took to running down scree, but a few got better and we were strolling back into camp by 9a feeling like we’d been on top of the world – or at least the African continent. Now that we’d climbed into the alpine zone on Mount Kilimanjaro we’d stay high and acclimate for two days as we moved around the south side of the mountain. After leaving Shira Caves, our goal was the Lava Tower. At over 15,000 feet, the Lava Tower was higher than anything in the continental US and a personal altitude record for most everyone in our group. Georgia was feeling much better today and everyone reached this altitude without a strong headache or other signs of AMS (Acute Mountain Sickness). As always, our lunches were crashed by the main example of Kilimanjaro’s fauna that we saw everyday, the white-necked raven. From the Lava Tower we’d drop down nearly 2,000 feet to the Barranco Huts to obey the “climb high, sleep low” theory of acclimating. Just before reaching the camp we passed through a large collection of tree groundsel – a forest seemingly dreamed up by Dr. Seuss. Arriving at camp in the early afternoon, we had some time to kill with journal writing, napping and Paul and I went out looking for photographic opportunities. 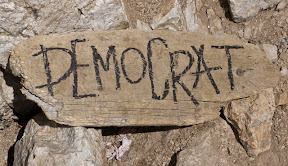 Now that we were camped up close to the mountain, I decided it was time to take some photos of our “sponsor’s” banner. The Boulder-based Skratch Labs had given us some free samples of their drink mix. Tara and I contacted them after trying their lemon and limes flavor on a few previous hikes and enjoying the taste. 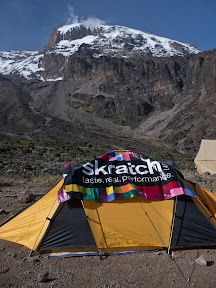 Built originally for pro cyclists we thought it could work equally well on Kilimanjaro. 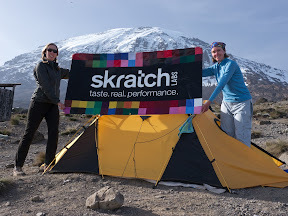 The philosophy of Skratch Labs emphases real food, a menu we enjoyed nearly daily on the mountain. While the pro cyclists have their team chefs, we had MJ’s soups, crepes, sausages, pastas and more. Leaving Barranco in the morning we had the crux of the day’s hike looming right out of camp – the Barranco Wall. The Wall was a steep-sided ridge that has the only real scrambling on the route – put away your trekking poles was the command from the guides as we’d need our hands. Immanuel and Samuel led us through the bands of steeper rock, showing us exactly where to go each time. By now, Samuel was even used to my wondering back or beside the trail for better photographs and once led me up an alternative route so I could shoot downward on everyone. Not everyone in our group had prior climbing or scrambling experience, but all did well reaching the top of the wall. Dusty, undulating trail then led us further towards our next camp – Karanaga Valley. Karanga Valley is a bit misnamed, since it is actually up above the Karanaga, meaning we had a final descent and climb back-up before stopping for the day. The Karanaga valley did provide the last tree groundsel I saw on our trip. Once again we strolled into camp to find that John (the camp manager) had organized everything and we were directed right to our tents and provided with our daily bowl of hot wash water. Some trekkers would continue past Karanaga, and combine today’s hike with tomorrow’s for a shortened trip. Wanting to spend a second night a bit above 13,000 feet, and give us the best chance to acclimate and approach summit day less worn out, we’d opted for a 7-day version stopping here. However, with it’s barren and open landscape, Karanaga was probably my least favorite camp of the trip. Having arrived early, Georgia taught a new card game to Tara and Claire while I walked about camp and shot a couple more photos of the Skratch Labs banner. By now we’d given some of the Skratch Labs mix to Georgia, Paul and Claire and a few of our guides – everyone enjoyed the flavor – a rarity for a performance drink mix. Is Mount Kilimanjaro the only mountain in the world with an international airport named after it? We arrived in the evening with no views of the mountain itself on a flight largely remembered for the prodigious snorer in 24J – right behind me. A driver from our outfitter – Tropical Trails – picked up the five of us and we shuttled were to Arusha then up to the Karama Lodge. I slept, but was woken up several times by howling dogs, roosters, a call to prayer and other farm and forest noises. Besides relaxing and recovering a bit from jet lag, our only goal was to meet with Tropical Trails to finalize arrangements for our Kilimanjaro climb, starting tomorrow. Samuel was introduced as our guide and we then each got writers cramps from signing over stacks of traveler’s checks to pay the balance of our trip costs. Back at the Lodge we started to get familiar with the local selection of lagers (Kilimanjaro, Safari, Tusker, etc). The second night passed with much the same cacophony as the first – with the addition of a single firework. Bright and early we meet Samuel and some of the rest of our guides and staff who would make the journey such a pleasure for the several hour ride to the Machame Gate. Clouds and a light drizzle made for a cool and sloppy start to our climb and we started up “pole pole” (“slowly, slowly” in Swahili) with different levels of excitement, anticipation and trepidation. We had doubts about the porters all carrying only the maximum allowed. With the clouds blocking any views, we had to look for interest at our feet or just off the trail in the cloud forest. For the first few days we’d be provided lunch in a plastic container usually containing: a chicken wing or breast, hard boiled egg, muffin, crackers or cookies, juice box, fruit (orange or banana) and maybe some other surprises. This first day was a fairly big one to start the hike – just under 4,000 feet of gain over about 6.5 miles. 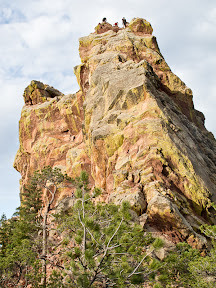 Thankfully, the rain had lessened as we’d climbed and we could hike without our jackets and stay a little drier. Our day’s hike finally ended at the Machame Huts – the hut being for the rangers where we learned to sign in, a procedure that would be repeated daily at each new camp. For us, our guides, camp managers and porters had setup tents, including a large floorless A-frame for our meals. Before dinner we wandered up to a clearing near the rangers hut and finally got a view of the peak we’d come to climb. At dinner we were finally introduced to MJ’s cooking – which was far better than many of the accounts we’d read of other Kili climbers. MJ’s meals struck a great balance between bland and spicy, western and African and often surprised us by the ingredients the porters had carried up (watermelon on day 4?, tilipia several days from the start?). We woke to clear skies, the cloud layer having settled during the night and by starting out early we’d stay above it all day. Georgia found herself in a struggle this morning – feeling sick and facing one of the steeper portions of the route she impressed all of us by continuing gamely up. More wildflowers and views of Kilimanjaro kept us interested as we hiked only a few miles to Shira Caves (but gained over 2,500 feet). We were also treated to our first views of the unique tree groundsel’s of Kilimanjaro. Samuel, Immanuel and Joseph (our guides) continued to keep us tightly grouped and moving slowly to better acclimate as we neared 12,500 feet. 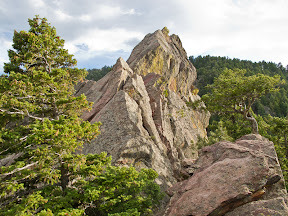 By now we’d passed well above the lushness of the cloud forest and were in a shrub land that reminded me much of Colorado’s juniper and sage valleys. Claire and I went off to find the Shira Caves, which were a little disappointing for their small size and not nearly as impressive as we’d hoped to find them. Immanuel then took Claire, Tara and I for a acclimation walk over to the neighboring Shira 2 campsite, used by people on the Lemosho route. Night came on with a wonderful display of stars and we could pick out the Southern Cross. 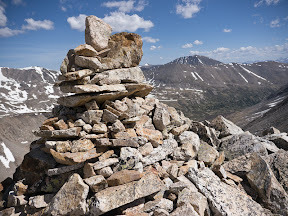 Pressured by an afternoon cookout and forecast for storms after noon, Tara and I drove to the Kite Lake campground and trailhead and joined the regular crowd of weekend 14er hikers on Mount Democrat. 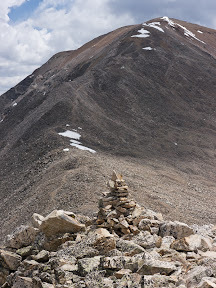 Starting at 12,000 feet, Democrat is a fairly easy 14er to hike. 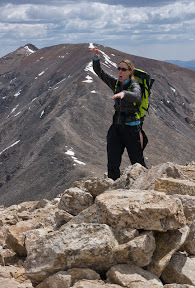 Still, starting a hike at 12,000 feet can feel difficult, with no real warm-up to the altitude. 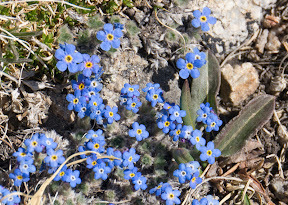 At least the wildflowers were out in a bit more abundance than our hike last weekend of Quandary Peak. The weather was also much warmer and far less windy than what we’d experienced on Quandary, a peak we could spot once we reached the saddle between Democrat and Lincoln. Like Quandary, we had a short snowfield to cross just below the summit, but this one wasn’t icy and not as steep. The sun was just as glaring however. We lucked out and timed our ascent perfectly to have the summit for ourselves. That, or we managed to scare everyone else away as we turned into high-elevation zombies above 14,000 feet. Clouds were building and a big feast was calling so we didn’t consider tackling any of the neighboring peaks (Lincoln or Bross), but headed down content with the one 14er for the day. Often it seems like Tara and I let each other make excuses to get out of activities, but for once we each motivated the other to get in a quick hike post work on Friday. I thought we were done with our string of snake sightings, but we spotted 3 on the hike up to the First Flatiron. One before we’d even left the parking lot. 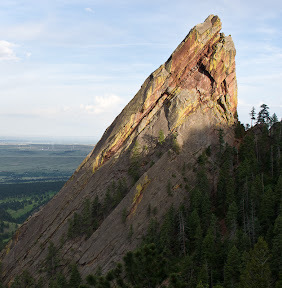 Delaying our hike let us view the Flatirons under better evening light. Saturday morning I joined the Boulder Cycling Club for my first group ride. We took a round-about way to Eldorado Springs and back to Boulder for a 30+ mile ride. After largely riding solo since adopting this new sport I found the stops to reform the group a little annoying (I’d rather keep up a steady pace the whole time), but certainly learned a lot about riding in a group and got “pushed” to climb harder which made for a better workout. Tara and I then headed to Denver to catch a rugby match – a sport I know nothing about and have no desire to play, but found more compelling to watch than football. Go Rocky Gorge! Quickly after moving to Boulder I noticed the faded spray-painted stencils along the multi-use paths. What were the “B180” and “B360”? 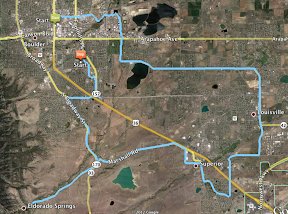 A little Google action turned up an annual ride sponsored by the City of Boulder Greenways Program. 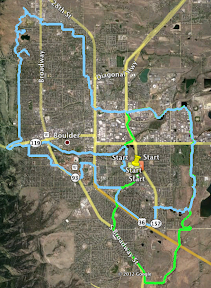 The routes change slightly every year to highlight new connections to the paths around town, but the B180 loops around half of Boulder while the B360 takes in the whole city. The rides start and end from the Scott Carpenter park. I wasn’t too interested in the family-friendly and likely crowded official day (June 3 this year), so when I noticed the 2012 routes were published (here on the Boulder website) and fresh markings appeared on the paths I decided to follow the new B180 route. I didn’t realize that portions of the route would be on dirt paths, so missed an early turn on the South Boulder Creek dirt path not far from CO 93. Cutting that ride short, I returned 2 days days later ready to try a couple miles of dirt on my road bike. Not ideal would be the consensus after nearly fishtailing through some gravel turns, but I stayed upright and managed to complete the loop during a lunch hour. Thinking (wrongly) that the B360 was all paved I took off the next day with a couple hours to complete the loop after work. I found the B360 route to be poorly marked in several spots (maybe that will be fixed by the time the event runs) and a few new connections were so fresh they were blocked off and the concrete was still drying. I also found another stretch of dirt and gravel (including a hill I’m slightly amazed I made it up on the 700×25 tires). Despite my complaints about the route marking and maps, I’m still glad I rode the routes and had my first tastes of dirt on the road machine and got to see some new-to-me portions of Boulder.